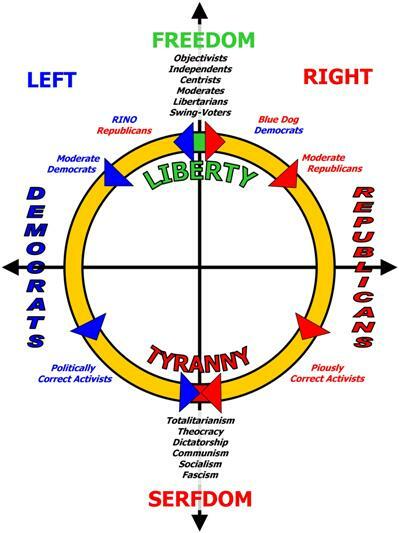 As Wikipedia defines it, "a political spectrum is a way of modeling different political positions by placing them upon one or more geometric axes symbolizing independent political dimensions". The range of political positions in this country are universally understood to be encompassed by a spectrum from left of center to right of center. In the USA we typically consider the spectrum running left to right with Socialists, Democrats, Libertarians Republicans, and Conservatives. This spectrum is displayed visually in several formats, a circle, a half moon, four quadrants, compass chart, and two others we will explain below, a square box, and a straight line, etc. The most usual and easiest to handle is the straight line. (This particular reference is just a sample. The plotting of particular people and beliefs is inaccurate.) Center being the true north of rational views on any issue. Left of center representing the more liberal or free thinking, unrestrained viewpoints. The right of center representing more conservative, traditional and responsible viewpoints. The square box is based on the Nolan Chart created by libertarian David Nolan. There are variants of this model such as the Pournelle chart developed by Jerry Pournelle in 1963, a two dimensional box chart but with different axis. Another variant is the "world's smallest political quiz" which rotates the Nolan chart to a diamond shape. The ADVOCATES for self government administers this quiz to help anyone quickly determine where they reside on the political spectrum. Take the "world's smallest political quiz" to find out where your views reside on the spectrum. Another quiz is available from Dr. Tim Groseclose, a 40-question quiz that allows you to calculate your "Political Quotient". At the end of the quiz, Dr. Groseclose also lists politicians who have PQs similar to yours. Or, take the "TIME Magazine quiz" to predict your political perspective. In the 3 columns below you will find updated stories on the political views (spectrum) of candidates and issues as they apply to us today. How do your beliefs align with the poliical debates of today? Take the quiz. Trump is President, but is Obama's Vision Still the Future of America? In the age of Trump, Americans are becoming ever more divided. Politicians on both sides of the aisle have contributed to the growing sense of discord by targeting specific ethnic or racial groups, but they probably aren’t to blame for the larger and growing partisanship based on political identity that is tearing communities apart. In 2016, before the election of Donald Trump, the Pew Research Center found that animosity toward those in the opposing political party had reached its highest level in almost 25 years and that for the for the first time in the study’s history, the majority of both Democrats and Republicans say they view the opposing party “very unfavorably.” Three years later, things have only gotten worse. The question is why. We can’t lay this all at the feet of divisive politicians. New analysis from The Atlantic suggests we should point our fingers back at ourselves. Working with several polling and analytics firms, The Atlantic created a ranking of U.S. counties based on partisan prejudice and found that geography (in a general sense) played some role in political animosity, specifically that political intolerance is often concentrated in urban areas. But the most politically intolerant Americans (who tend to be urbanites) also tend to be whiter, more highly educated, older, and more partisan themselves. Higher education seems to be a key factor in partisanship, since people who attend graduate school appear to experience the least amount of political disagreement and therefore have less exposure and respect for anyone with conflicting ideas. When it comes to minorities, The Atlantic’s investigation confirms the somewhat counter-intuitive finding of other studies — that nonwhite people tend to be more open to opposing viewpoints because they routinely encounter political disagreement and have more diverse social networks that introduce them to a variety of opinions and more importantly, help them to associate ideas they disagree with, with people they like. Will Millennials Become More Conservative?